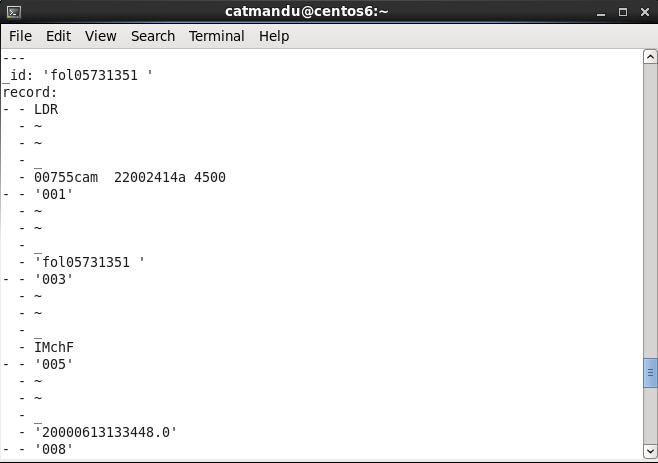 In the previous days we learned how we can use the catmandu command to process structured data like JSON. Today we will use the same command to process MARC metadata records. In this process we will see that MARC can be processed using JSON paths but this is a bit cumbersome. We will introduce MARCspec as an easier way to point to parts of a MARC record. 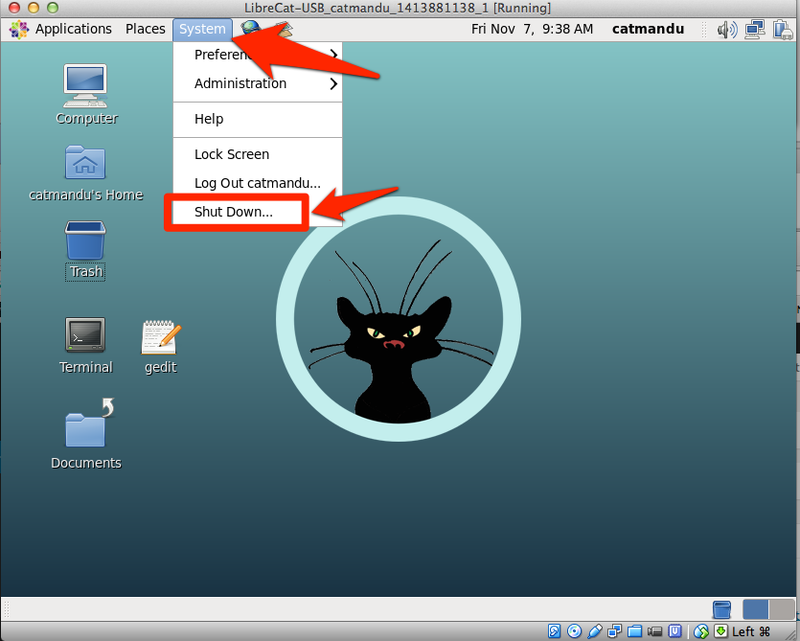 As always, you need to startup your Virtual Catmandu (hint: see our day 1 tutorial) and start up the UNIX prompt (hint: see our day 2 tutorial). When transforming MARC into YAML it looks like something with a simple top level field _id containing the identifier of the MARC record and a record field with a deeper array structure (or more correct an array-of-an-array structure). What is happening here? The MARC file Documents/camel.usmarc contains more than one MARC record. 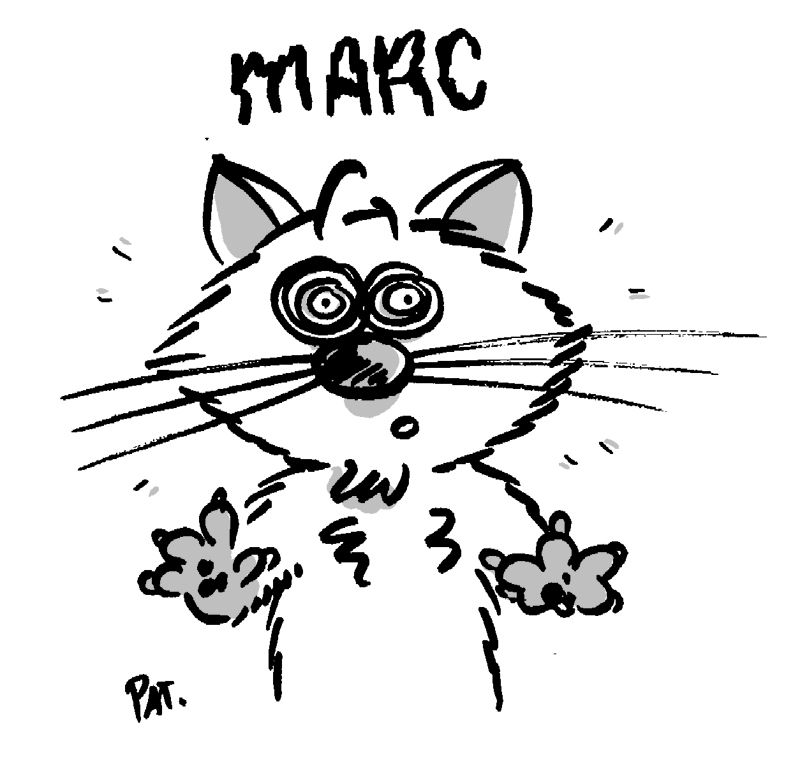 For every MARC record catmandu extracts the _id field. We used here a copy_field fix to extract the value into a field called leader. The retain_field fix is used to keep only this leader field in the result. To process MARC data this way would be very verbose, plus you need to know at which index position the fields are that you are interested in. This is something you usually don’t know. Where myfixes.txt contains the fixes above. More elaborate mappings are possible. I’ll show you more complete examples in the next posts. As a warming up, here is some code to extract all the record identifiers, titles and isbn numbers in a MARC file into a CSV listing (which you can open in Excel). "fol05731351 ","0471383147 (paper/cd-rom : alk. paper)","ActivePerl with ASP and ADO /Tobias Martinsson." "fol05754809 ",1565926994,"Programming the Perl DBI /Alligator Descartes and Tim Bunce." "fol05843555 ",,"Perl :programmer's reference /Martin C. Brown." "fol05843579 ",0072120002,"Perl :the complete reference /Martin C. Brown." "fol05848297 ",1565924193,"CGI programming with Perl /Scott Guelich, Shishir Gundavaram & Gunther Birznieks." "fol05865950 ",0596000138,"Proceedings of the Perl Conference 4.0 :July 17-20, 2000, Monterey, California." "fol05865956 ",1565926099,"Perl for system administration /David N. Blank-Edelman." "fol05865967 ",0596000278,"Programming Perl /Larry Wall, Tom Christiansen & Jon Orwant." "fol05872355 ",013020868X,"Perl programmer's interactive workbook /Vincent Lowe." "fol05882032 ","0764547291 (alk. paper)","Cross-platform Perl /Eric F. Johnson. In the fix above we mapped the 245-field to the title. The ISBN is in the 020-field. Because MARC records can contain one or more 020 fields we created an isbn array using the isbn.$append syntax. Next we turned the isbn array back into a comma separated string using the join_field fix. As last step we deleted all the fields we didn’t need in the output with the remove_field syntax. In this post we demonstrated how to process MARC data. 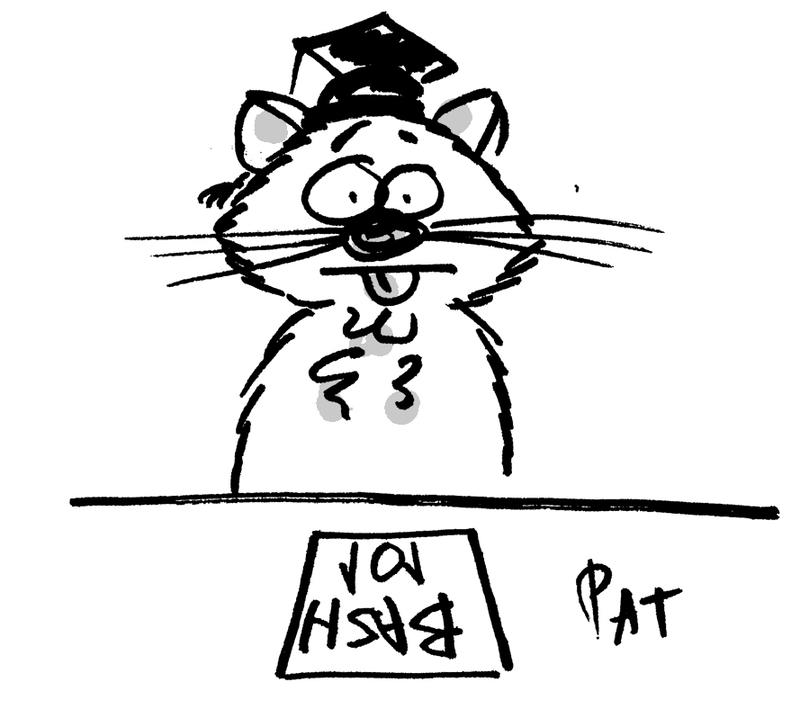 In the next post we will show some examples how catmandu typically can be used to process library data. You will be presented with the GNU nano text editor. When you want to save this text into a file type Ctrl-o (that is pressing the Ctrl-key and ‘o’ key on your keyboard). In the bottom of the screen nano will ask for a filename. Type for instance ‘hello.txt’ as filename as press return. The file ‘hello.txt’ is now created on disk. We can test this with the commands we learned in the previous tutorial. You will see now the text created in the nano editor. 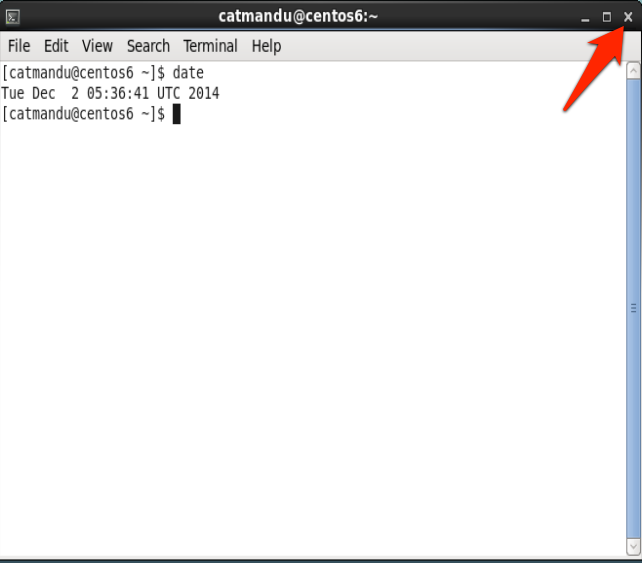 With the UNIX command ‘ls‘ you can view all the filenames in the current directory. If you want to add more text to this file you can start again the nano editor with a file name. You will again see the text you can edit and save again with Ctrl-o and exit nano with Ctrl-x. Here we use the key ‘>’ to redirect the output of the command grep to a file named ‘bolkonski.txt’. Next we can use nano to inspect the contents of this file. By the way, you don’t need to type in the complete filenames in all the commands we have shown in the examples. When you type ‘bo’ and hit the tab-key then UNIX will autocomplete the file name to ‘bolkonski.txt’. I’m lazy and would type ‘cat bol’ and press tab . Again you can use Ctrl-x to exit nano. You can view all the files with the ls command. This concludes our short excursion into UNIX. 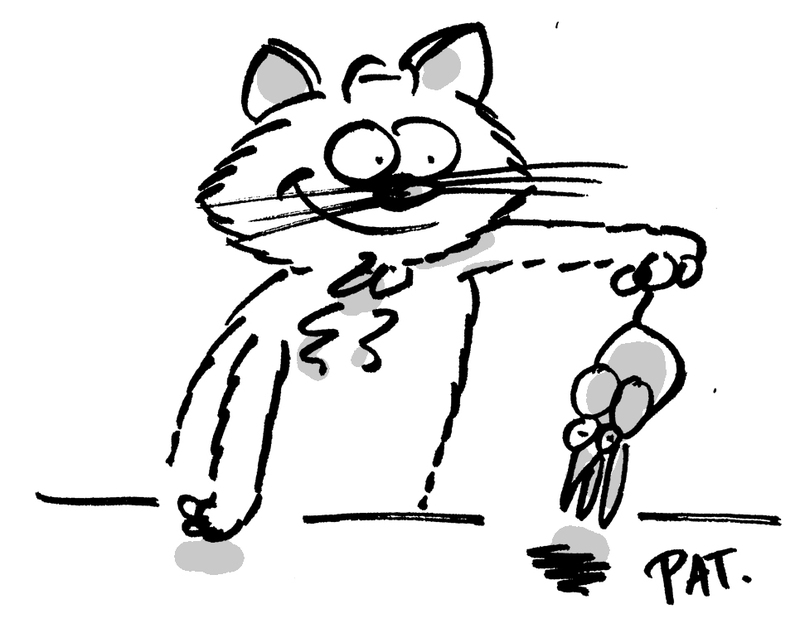 Monday we will be back with a new chapter: processing JSON with Catmandu. Have a nice weekend! First we are going to learn you a new UNIX command, cat. In our Catmandu project the cat command is our favorite. With this command you can read War and Peace in 2 seconds! Lets try it out, type ‘cat Documents/war_and_peace.txt‘ on the UNIX prompt and press ‘enter’. “What was that? !” you might wonder? Well, that was the complete War and Peace running across your screen. We provided cat command with one argument ‘Documents/war_and_peace.txt’ which is the filename that contains the complete text of War and Peace (this text I downloaded from the Gutenberg Project for you). The output contains three numbers: 64620 , 563290 and 327203. The first number counts the number of lines in the file Documents/war_and_peace.txt. The second number counts the number of words in Documents/war_and_peace.txt. And the third number counts the number of characters in Documents/war_and_peace.txt. Five hundred sixty-three thousand two hundred and ninety words counted with one simple command! This is the power of command line processing. The file Documents/war_and_peace.txt contains the English translation of War and Peace. We can count the number of times the word ‘war’ is mentioned in this novel. You need to use a new UNIX command, grep, to do this trick. Type the following commands at the UNIX prompt and I will explain in a moment what happens. We count 274 occurrences of the word ‘war’ in War and Peace. With the cat command we read the document Documents/war_and_peace.txt. With the pipe ‘|’ symbol we send all the text of this document to the grep command, where we use the -ow option to search for the word ‘war’. With the pipe ‘|’ symbol we send all the ‘war’ words to the wc command which will count the number of ‘war’-s.
, then you will count all these ‘war’ lines. Pretty neat, eh? We get 23 more occurences. This proves ‘peace’ is mentioned only 110 times and ‘war’ 297 times! Your screen will now show the first page of War and Peace. When you press the spacebar the next page will be displayed. 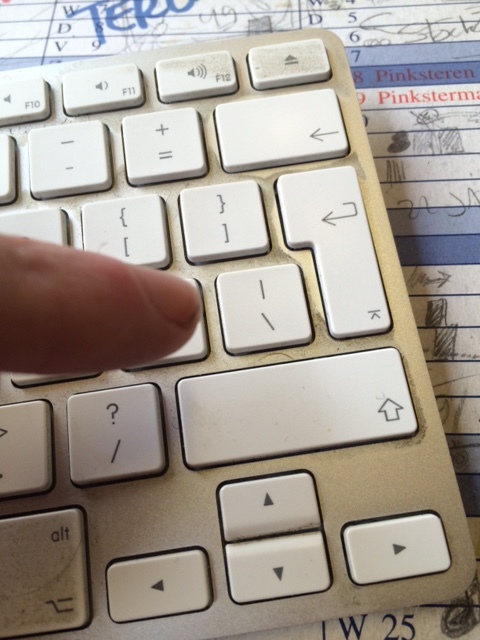 Pressing spacebar again you see again a next page, etc etc. This way you can slowly page through long result lists. When you press the ‘b’ key you will go one page back. To exit this less command press the ‘q’ key. Some more examples of what we have learned. The answer is 178 lines. This answer is 580 times. The screen above is called the “UNIX prompt” or the “command line” and we will use it to execute UNIX commands. 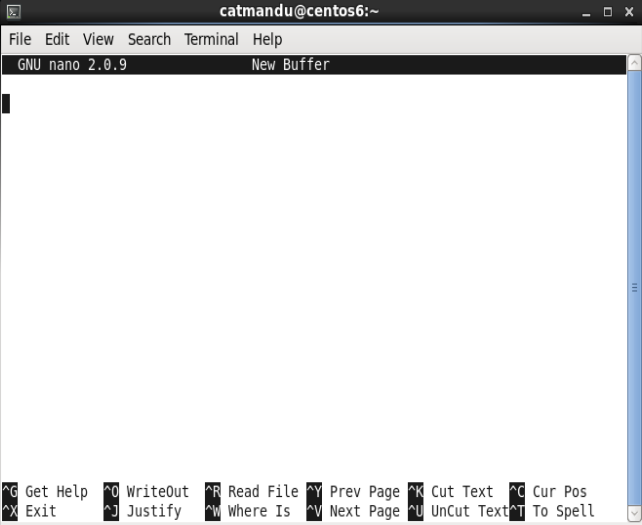 All Catmandu commands were written for this “command line” because it provides the powers of UNIX coupled with the Perl programming language. 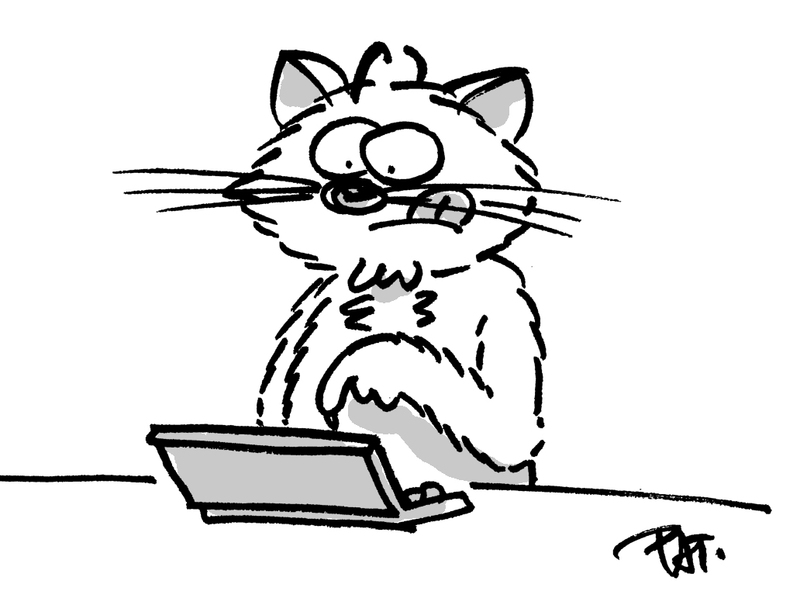 You see from this output that there is named ‘catmandu’ working in your Virtual Catmandu. That is you! UNIX provides thousands and thousands of commands you can excute this way. For every imaginable task there exists a command. 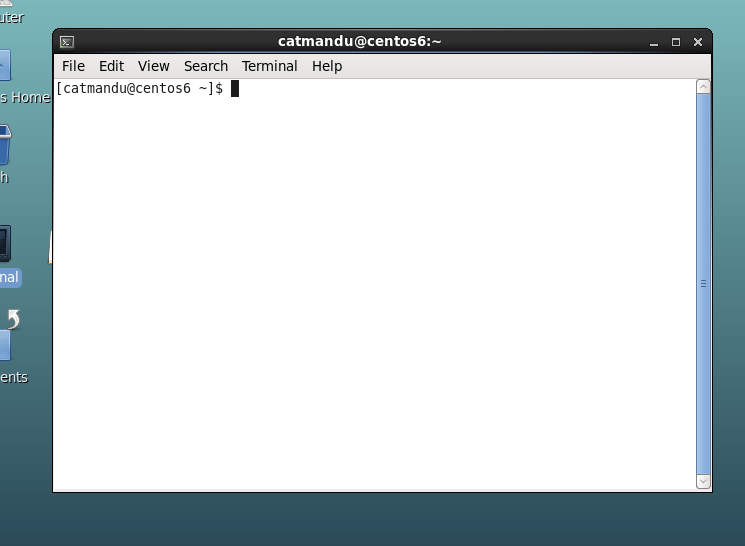 In the coming days we will use the UNIX prompt to execute Catmandu commands to process library data. Before we can do this, we need to give you a little more context how these UNIX commands work. (by the way, the $-sign you see above isn’t part of the command but an indication where the UNIX prompt is so that I don’t have to upload a screenshot for every example). When you type “echo 123” the command will print ‘123’ as output. When you type “echo 123 abc def” the command will print “123 abc def” as output. In the example above, the echo command had 4 arguments: 1 sentence and 3 words. Some commands accept also options. With options you can change the behaviour of commands. Some command have no options, some have many options. 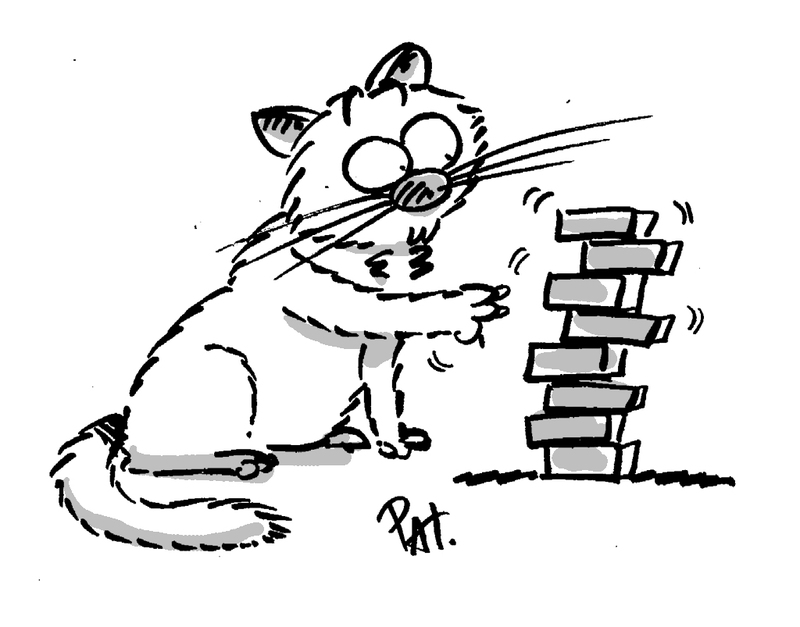 With Catmandu you will encounter commands that love to provide you a lot of options. For now lets keep things simple. 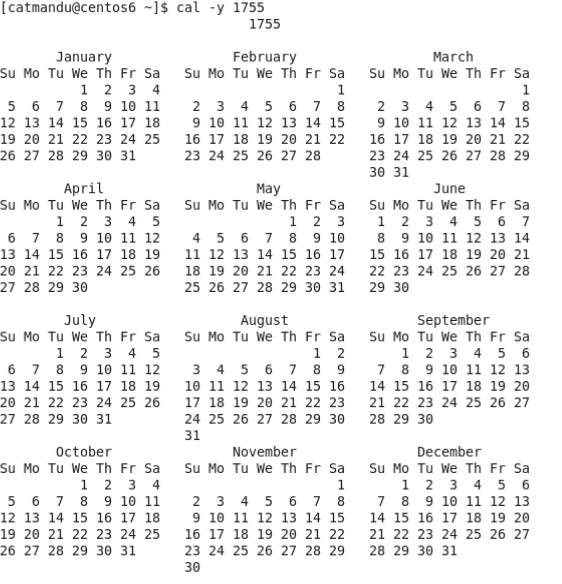 The UNIX cal command can be used to output a calendar for the current month. That was enough for today. Tomorrow we will show you how to work with files and do a bit of text analysis. 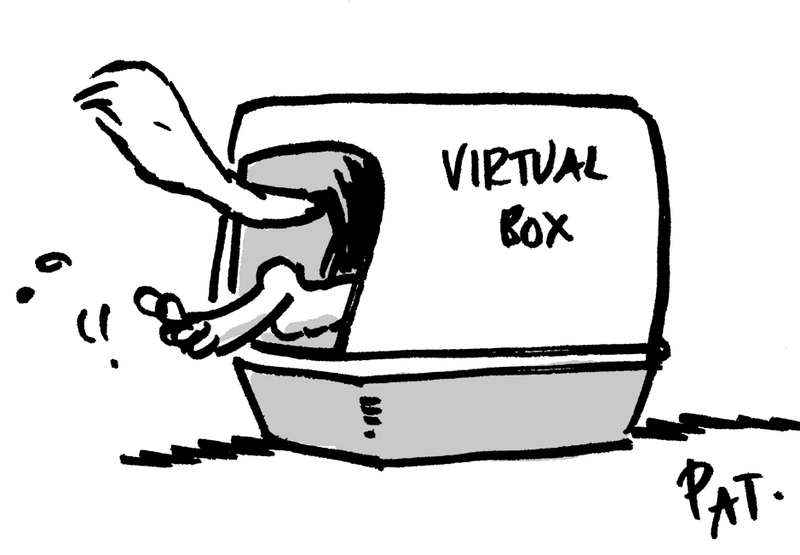 Today we will give you a short introduction in Virtual Box so that you can find your way in the next lessons. In the previous post you have learned how to install a Virtual Catmandu and start the system. Do it now, we will show you some basic commands. On this desktop you will find some icons we will be using a lot in the next days. 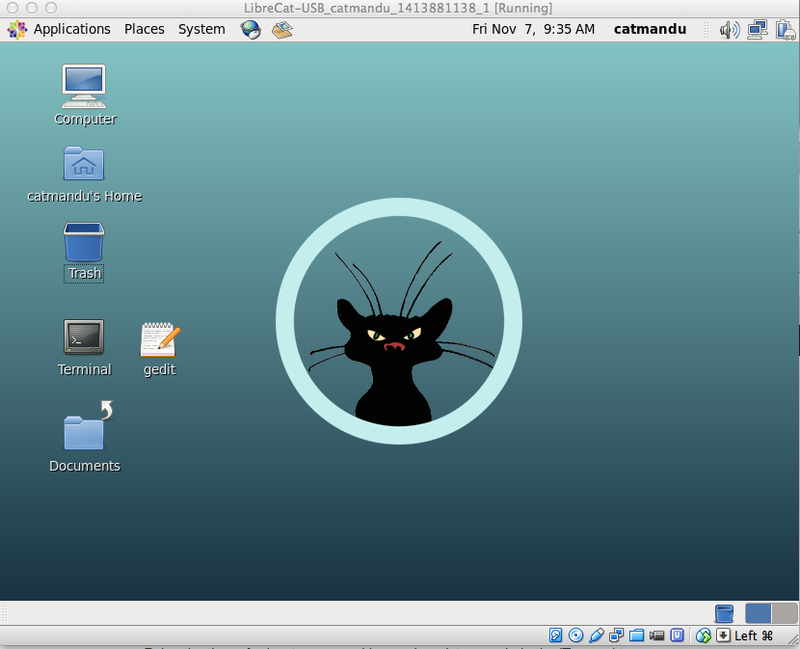 Double click on the icon named ‘LXTerminal’. You will be presented with what is called a “UNIX prompt”. 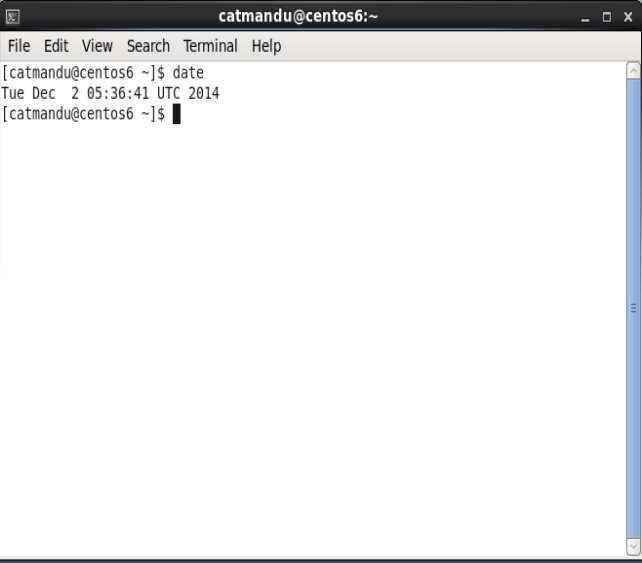 In this window you will be typing in the next days UNIX and catmandu commands. Type ‘date’ in this window and press enter. You will see that the computer calculated the current UTC date. This is what IT-pros are doing the whole day: calculating the date. Next, we can try to close this window. This you can do with the little X-icon at the top right of the UNIX prompt screen. Click it, you’ll see again the desktop. The next icon we are going to try is ‘Leafpad’. Double click on it and you will presented with a text editor. This is so nice that we are going to safe it as a file. To do this you need to go to the ‘File’ menu at the top and choose ‘Save As…’. We are going to safe this text as ‘poem.txt’ in the ‘catmandu’ folder. 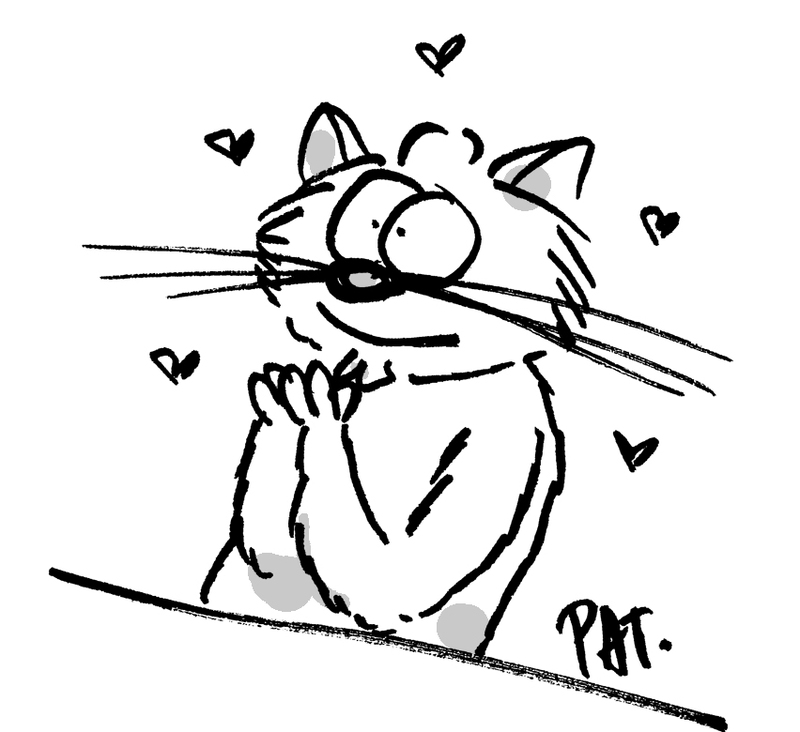 Type this filename and choose the catmandu folder and click on ‘Save’. Voila, the poem is saved. You can now close the Leafpad window with the little x-icon at the top right. And we are back on the desktop. In the new window you see ‘poem.txt’ click on the name and at the bottom on ‘Open’. As a result you will see again your poem in the ‘Leafpad’ window. Congratulations! Now that you know how to edit files you know how to edit programs. Tomorrow we will learn some UNIX commands.